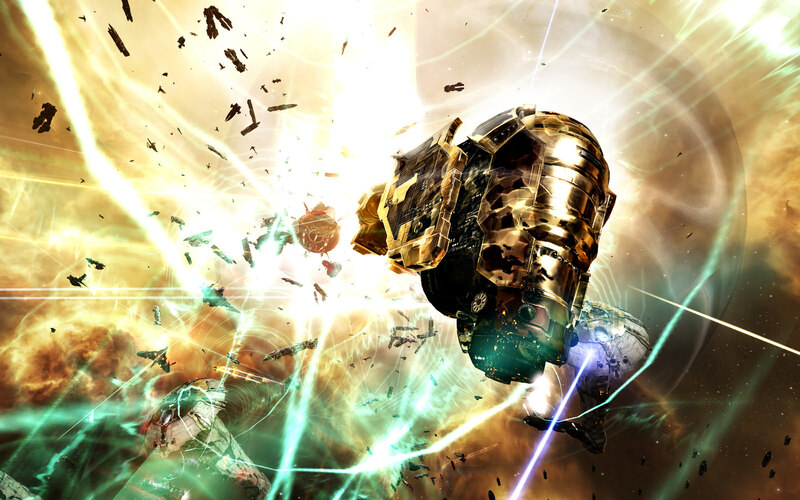 The 24-7 total-immersion Sci-Fi universe that is EVE Online creates a wealth of opportunities for streamers, youtubers like the author, even fiction writers setting tales within its universe. 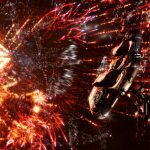 Less attention is given to the photographers of EVE Online. While just about anyone can press ‘printscreen’, there are some that take it to a whole new level. Amongst these, Signal Cartel member Razorien recently clocked over 2,000,000 views of his images. We reached out to him on discord for his thoughts on the widespread acclamation earned by his work. EN24: Your photos get very high reviews from the community. Why did you decide to become an Eve-photographer? 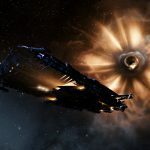 Razorien: Photography has long been a keen interest but becoming an EVE photographer is something that happened over time more than being a single decision. After my daughter was born I no longer had much time for real life photography excursions and was looking to fulfill my desire to create with other projects. 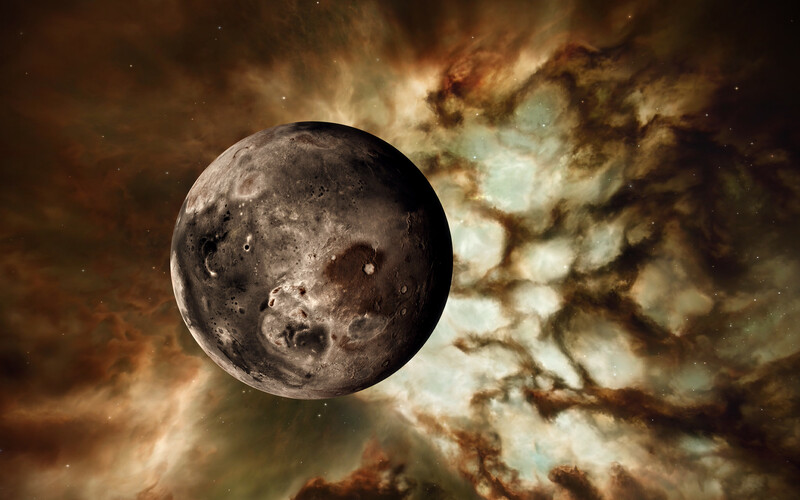 As a big fan of science fiction and gaming, when I discovered EVE online the visuals really sparked my imagination about life and travel in space. I started experimenting with creating a few simple wallpapers and the response was very positive, so I made a few more and on it went, becoming a positive spiral to where it is now. It was somewhere in the middle, when capturing and editing screenshots started consuming all my game time that I realised I had become a full time EVE photographer. EN24: So it snuck up on you then? It’s interesting to hear you speak of editing, most comments on your work ask what monitor you’re using! Care to elaborate a little on your creative process? Razorien: It did, I was being referred to as a photographer long before making it part of my EVE identity. Questions about editing vary a lot but a common myth is that I must have really high-end hardware. Today, a single low-end monitor and mid-range graphics card is enough to create 4k screenshots. In Windows, both AMD and NVIDIA drivers will let you create artificially high resolutions, up to four times your native monitor resolution. I use that together with high graphics settings in the game to capture as much detail as possible. The process of actually taking the screenshots in the game is almost identical to doing any other form of photography and using all the game camera controls to best effect. When capturing I take a lot of pictures, often several of the same subject to have some to choose from later. For every picture that ends up in my gallery there were at least ten more that got rejected. With experience you get better at reading the in-game situations that arise and anticipate what will happen next, allowing more time to set up a well framed shot. Post processing is all done in Photoshop, where I selectively boost color and contrast to highlight main subjects and give the images a signature style. When someone asks me exactly how it’s done step by step I never reveal it. I think it’s important that anyone interested in this develop their own personal look and style. Post processing and photography tutorials are abundant and a big part of the fun is to experiment and find your own way of doing things. EN24: Would you mind explaining or linking that trick to maximize the screen resolution? And AMD: https://www.amd.com/en/technologies/vsr It’s the same thing but they have their own names for it. EN24: So, when producing your work, how much of it would you say is corp-alliance related, and how much is your own personal interests, or is there no distinction between the two? Razorien: My personal interest is in always trying to capture the moment regardless of the circumstances. I enjoy roaming around on my own just as much as being invited to an alliance fleet or covering a major event in the game, which I think is reflected in the mixed body of my work. As a member of Signal Cartel and the EvE-Scout Enclave, my alignment is neutral with peaceful intent. I never take sides and benefit from a hightened level of trust from this neutrality, which is strictly enforced by our credo. EN24: There have been some comments made about how retouched and edited images and sped-up videos of fleet fights are a kind of false advertising, ie, making the game look smoother, faster than it really is. 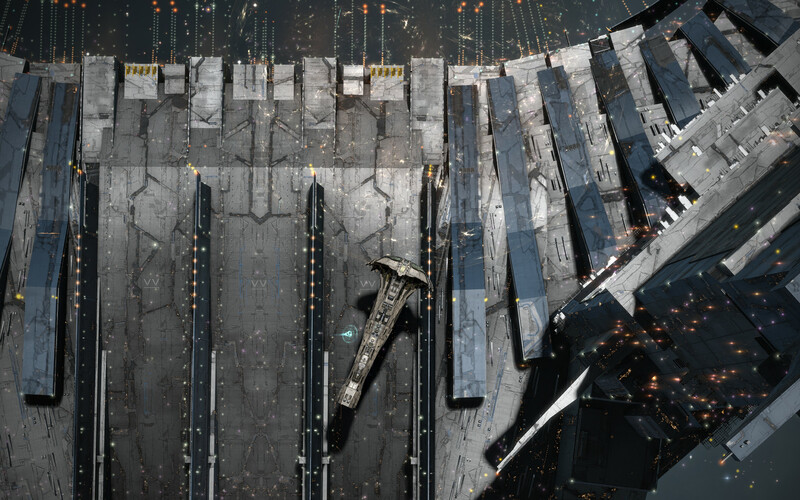 Do you think CCP abuses this enhanced user-generated content? What I mean to ask is, are they benefiting from the promotion while not seeming to take many concrete steps towards making the reality of the ingame experience closer to what such visionary contributors, including yourself, feel it should / could be? 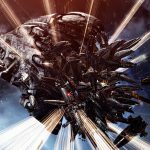 Razorien: I know at least some current and ex-CCP employees enjoy browsing my gallery and if any of it provides a source of inspiration for their work, I would consider it a big compliment. I’m sure they have tons of great ideas about how to improve visual fidelity but since the game has to render graphics and effects in real-time, memory and performance budgets will be a limiting factor. When editing still images, performance isn’t typically something you need to worry about. If my work helps promote EVE I think that’s great. My own and others work may create a wider gap between expectaion and reality than unprocessed footage but nowhere close to how most of CCP’s own video trailers make EVE look spectacular. EVE isn’t just about nice visuals though and I know a lot of people play on low graphics settings to increase rendering performance. I try to embed a bit of what EVE can feel like to play in my images, from the intensity of a close fight where everything is on the line to an explorers solitude roaming the stars. EN24: So could you share and comment on some of the most unexpected / surprising moments you have captured over the years? Razorien: I never expected an album only featuring moons of New Eden to get many views. The album was a success but this image in particular ended up on Flickr Explore, receiving a lot of attention from outside the EVE community. It is one of my most popular images. Being close to a Keepstar citadel gives you a sense of their immense size but only to a certain point using the default camera settings. This image of an Avatar titan was taken with compressed perspective as it was positioned very close to the structure. It highlights the true size of the citadel in a way I had not seen before. During the in-game event for the coronation of empress Catiz there were skirmishes between different player groups. When focusing the camera on this Guardian I noticed that the pilot (Cassiel Seraphim) was a good friend from my early days in EVE, making the taking of this image more unexpected and personal than most. EN24: If you had to choose, which of your still shots do you feel tells the most powerful story? 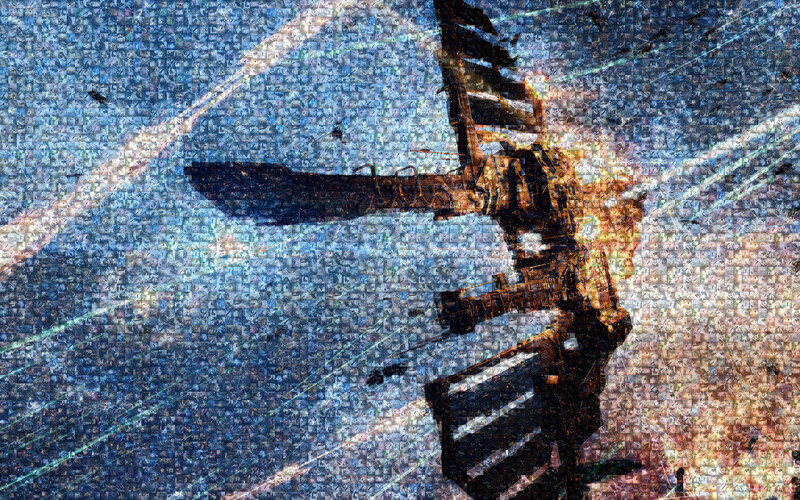 Razorien: This image is a code generated art project based on my most popular image so far, taken during one of the massive battles that are unique to EVE. Every little square is another one of my images and the purpose is to convey that the EVE experience is made of many individual moments that add up to something larger. 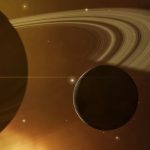 EN24: So what do you think the future holds for eve and your unique place within it? 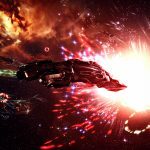 Razorien: The past and future of EVE always seems to be a hot topic but I tend not to speculate about the direction of the game itself because of my sole focus on photography. Generally things are smooth but trying to capture each stage of the recent battle in 9-4RP2 was a very frustrating experience, with significantly more game client issues than I’ve encountered in the past. Recent discussions about structure engagement mechanics suggest this might be a trend, which would take the fun out of trying to capture big battles where structures are involved. Another recent development is the layoffs in the community team, where the surface area between developers and community has been significantly reduced. The drop in shout-outs and features of community art is very noticeable and as a creator does detract from the experience. 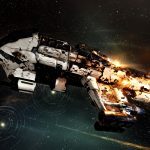 To end on a more positive note, EVE visuals are looking better than ever and there has been a steady stream of updates which keeps things interesting. Going forward I also want to experiment a bit more with code generated art around EVE and have a few ideas to get started on when time allows, stay tuned. I learned a few valuable things in my talk with Razorien. For one thing, that investment in a 4k monitor is getting pushed back! I’ll leave you with a few examples of what I feel is some of his best recent work. The shot combining my favorite t1 Carrier, a Nidhoggur, with a wormhole just behind it, to me says something about facing the unknown with all you’ve got on the line and is actually my wallpaper at the moment. But don’t limit yourself to the small selection that fits in this feature. You can browse the full collection to your hearts content on Razorien’s Flickr page. Hey there. I found your site via Google whilst looking for a comparable subject, your site came up. It appears good. I have bookmarked it in my google bookmarks to come back then. Hi there. I found your blog by way of Google while searching for a similar matter, your web site came up. It seems to be good. I have bookmarked it in my google bookmarks to visit then. Hey there. I found your web site via Google while searching for a similar subject, your website came up. It looks good. I have bookmarked it in my google bookmarks to visit then. Really excellent visual appeal on this web site, I’d rate it 10 10. Hiya, I am really glad I’ve found this info. Nowadays bloggers publish only about gossip and net stuff and this is actually irritating. A good website with exciting content, this is what I need. Thanks for making this site, and I will be visiting again. Do you do newsletters by email? Hey there. I found your website via Google while searching for a comparable topic, your web site came up. It seems to be good. I’ve bookmarked it in my google bookmarks to visit then. Hey there. I found your website by way of Google while searching for a related matter, your web site came up. It appears good. I’ve bookmarked it in my google bookmarks to come back then. I’m finding them for my sister. I’m trying to find one of the most recipes with pictures as well as the ages of child for the dishes. Blog sites are normally where I would expect to discover them. Hello there. I found your blog via Google while looking for a related topic, your website came up. It seems to be great. I’ve bookmarked it in my google bookmarks to come back then. Hi there. I found your website via Google whilst looking for a related topic, your site came up. It appears good. I have bookmarked it in my google bookmarks to come back then. Hiya, I’m really glad I’ve found this information. Nowadays bloggers publish only about gossip and web stuff and this is actually annoying. A good web site with interesting content, that’s what I need. Thank you for making this web-site, and I’ll be visiting again. Do you do newsletters by email? Hiya, I’m really glad I have found this information. Today bloggers publish only about gossip and internet stuff and this is really frustrating. A good website with interesting content, this is what I need. Thank you for making this web-site, and I will be visiting again. Do you do newsletters by email? Hi there. I found your website via Google while searching for a related subject, your web site got here up. It looks great. I have bookmarked it in my google bookmarks to visit then.